In Commercial Real Estate, video has become the best way to showcase important assets. Now more now than ever you can use the power of professional video production to make a difference in your marketing. In contrast, hiring based solely on cost could be a massive mistake and cost your brand. We produce professional commercial real estate video for many of the biggest brands like CBRE, JLL, Hodges Ward Elliott and many more. Everything from standard video, drone video, virtual reality, 360 video, augmented reality, mixed reality and beyond. Below is an example with standard video, drone video, helicopter video, and mixed reality elements that we created for thyssenkrupp, Wakefield Beasley Architects and the Atlanta Braves Development Company. A fully produced cinematic commercial real estate video is very popular. The luxury hotel market has the right idea using these types of videos to market the complete experience. To be effective you have to show the experience that you are offering and do it quickly. Show off your assets with high quality production that not only features your commercial real estate but also the area around your property. Sell with commercial real estate video images that match with the feel of your brand. In this example, we were able to show the context of the neighborhood, a vibe for the neighboring major companies and the hotel amenities all in under 2 minutes. Let your commercial real estate video shine by telling your story not by a hard sell. As a bonus, you could take these scenes and break them down into highly targeted Instagram videos. We have many successful strategies for leasing and retainment of commercial real estate investments. 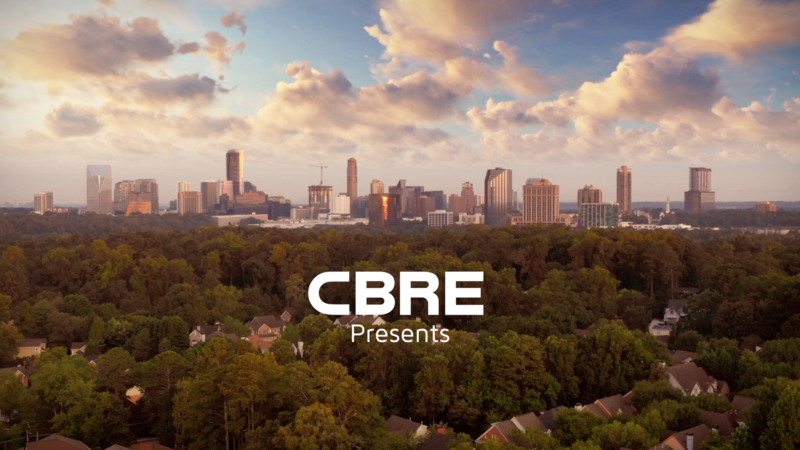 Endorsement and selling with geographical context are two prime examples that you can see in these videos produced for CBRE. Here is an example of a new upcoming property being marketed with a drone panorama of the area. In this CBRE project we called out the area where the future building will sit and also added context showing the exact location. Finally, the key stakeholders gave a brief video description of specific project characteristics. Secondly, here is an example using drone video to show future views for a mid-rise or high rise project. This project for Kim King used drone video to show future specific condo views, but also used drone panoramic images to show 360 views from each floor. We enjoy mixing amazing technology for fabulous results. This example joins drone video, Matterport virtual tours and some text special effects to market a huge office space. Another way to offer a unique perspective of your project on a weekly, monthly or quarterly basis is a drone video update. This use of commercial real estate video offers tremendous value for marketing, but also for social media, recruiting and much more. The Miami Cancer Institute uses their monthly updates to update key stakeholders in the project. Executives also use the video in personal and group meetings. In conclusion, these ideas are game changers and we are seeing more and more commercial real estate companies looking to use them with their upcoming marketing. Smart. Please, contact us if you have interest and we can answer any and all of your questions. You can see our commercial real estate video portfolio here.